After finishing the back end of the body, except for some cosmetic work, it was time to turn my attention to replacing the left front wheel housing. However, a good bit of prep work is necessary before I can consider mounting the donor. 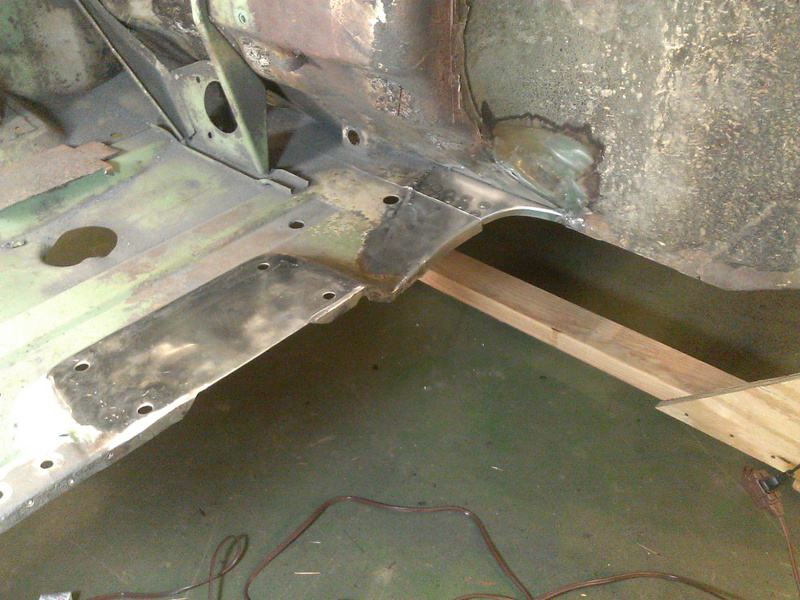 The left-rear of the engine compartment floor and adjacent areas of the firewall and passenger compartment floor need rebuilding; the portion of floor under the left-side suspension tower needs replaced; and the front cross-member assembly needs straightening and patching. 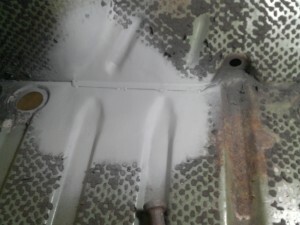 In this post, I cover repair of the engine compartment floor and adjacent areas of the firewall and passenger compartment floor. 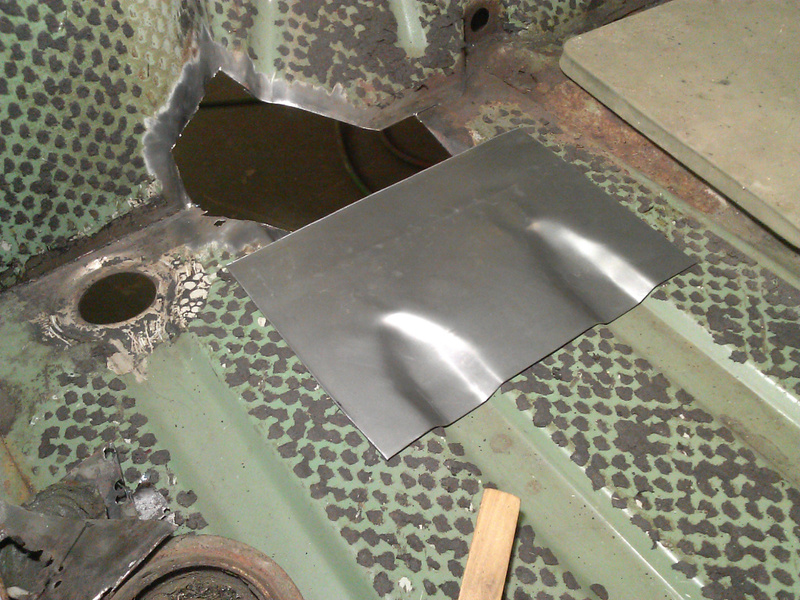 I had been wondering for a long time how I would patch the floor pan. The pan has corrugations for rigidity that gradually terminate near the end of the pan. I knew that I could patch in flat pieces of sheet and fill any gaps, but I don’t want to be driving a post-apocalypse survival type vehicle. I want to feel like I’m back in 1966 with a car that gives me that new car feeling. 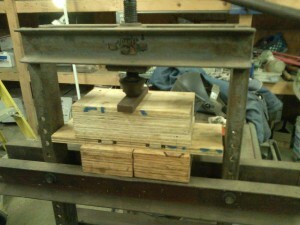 Then I remembered a Dake screw press that I picked up for $25 from a Ford dealership going out of business. It had been hibernating in my garage for decades so I dragged it to my barn to try it for pressing panel patches. For the passenger floor patch, I made dies with scrap 3/4″ plywood. 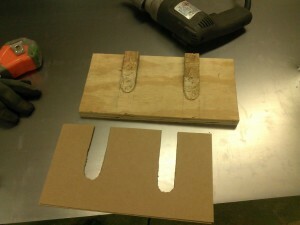 The first photo shows the male part, with some OSB strips glued in place to form the corrugations, and some cardboard shims to fine tune the depth. The press didn’t come with any arbor plates, so I glued and screwed 5 sheets of 3/4″ plywood scraps to make blocks rigid enough to serve as arbor plates. This second photo shows the patch being pressed. This was rather easy because the passenger compartment floor is 20 ga steel. This surprised me a little because I thought SAAB used 18 ga, or thicker, everywhere. This photo shows the result. And this photo shows how well the patch matches the factory corrugations. You can imagine my elation at this point, not bad for a rank amateur. I later cut the openings somewhat larger, as shown in the next photo, to obtain an easier to fit cut-out, and to remove some pitted areas. 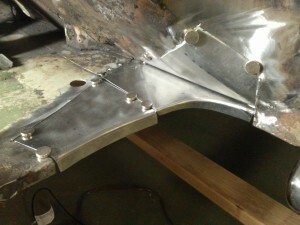 After expanding the cut area, it was necessary to trim the patch and form a curved flange where it meets the wheel well. 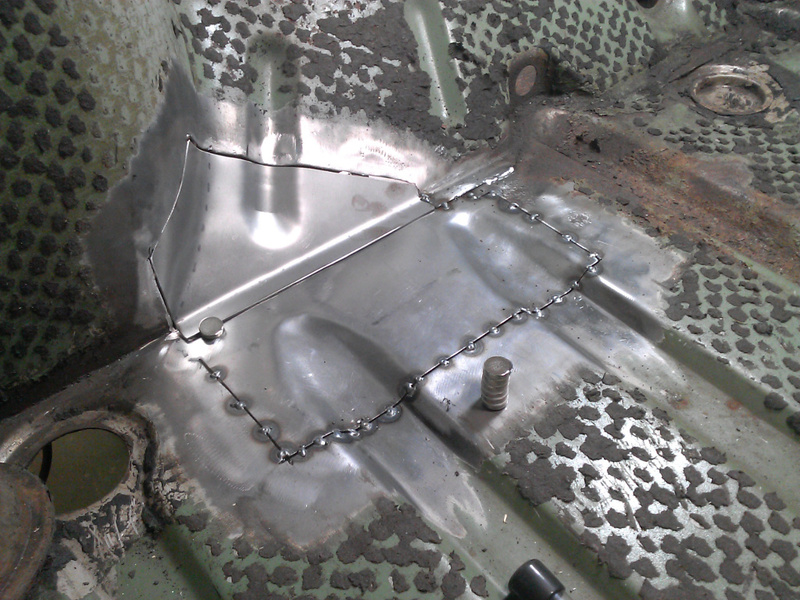 Jumping ahead a little, here’s shot of the finished floor patch tacked in place with the finished flange. Before removing the damaged wheel well, I had traced the curvature on a piece of cardboard. Using that trace, I traced the curve on the patch and added enough for the flange. 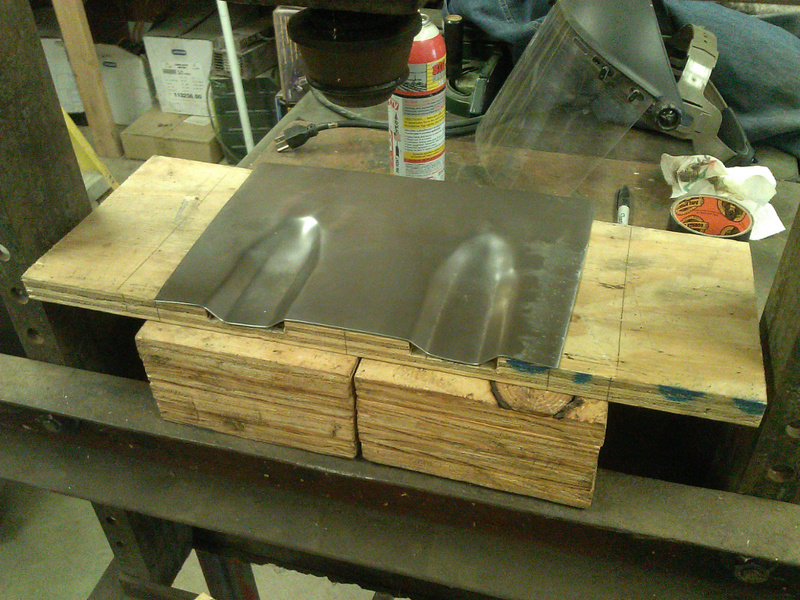 I then cut two pieces of plywood with the same curvature, clamped the patch between the pieces, and gently hammered the flange to shape with the tools shown in the photo. The old Dake press works great for clamping. The firewall patch proved to be a bit harder because of the compound curve where it meets the curved fender well portion, and partly because it’s a thicker 18 ga metal. This corrugation is a bit deeper, and it’s a gentle curve throughout. 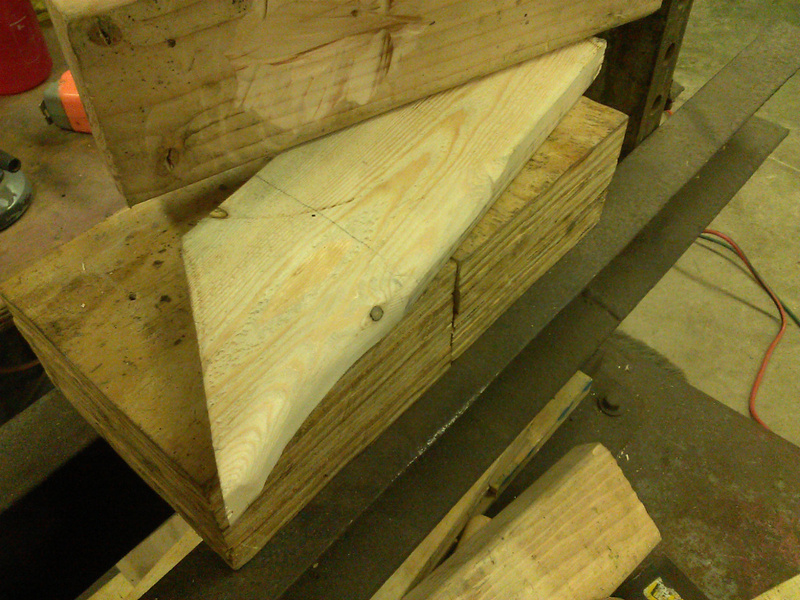 To make dies matching the original, I clamped a couple 2×4 pieces together, and bored between the edges, offset enough so that the female die would be the correct depth. You can see the dies in the photo. The female die was then sanded to the same shape as the original floor corrugation as you can see in the photo. If I remember correctly, I used a 1″ bit to bore the hole, and I used an 11/16″ deep-well socket in the upper die to press the corrugation. The end result is shown in the photo. It was easy to bend the bottom flange on the patch using a press brake, however, the compound curve portion was more of a challenge. I started with a piece of 2×4, and I kept sanding with my angle grinder, trying to match the contour of the compound curve. After numerous trial and error attempts, the wood was shaved down to 1×4 thickness, but I had a good shape as shown to use as a form for hammering the patch to shape. 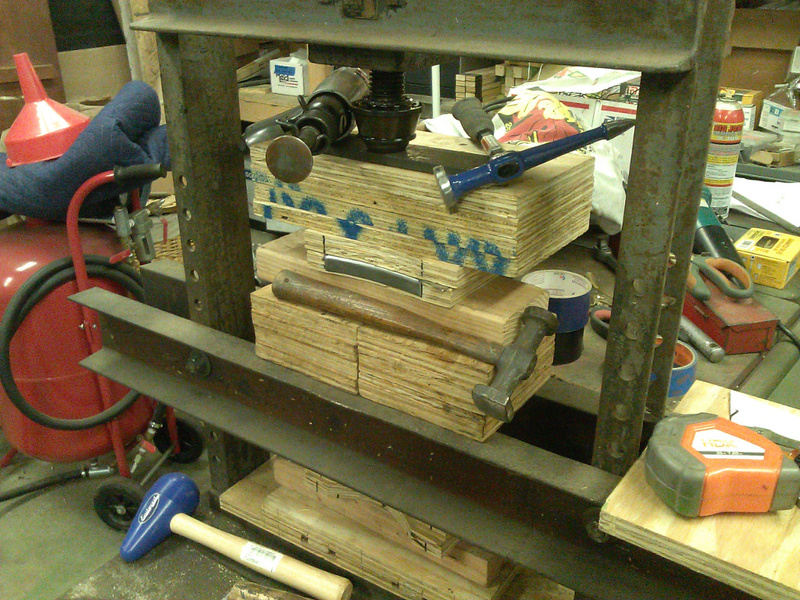 Clamping the patch in the press with another piece of 2×4, which had a cut-out to clear the corrugation, I gradually formed the curve with gentle hammering with appropriate sheet metal hammers. I didn’t trim the curved area to final size until after the curve was almost completely formed. I had left excess metal because I couldn’t figure in advance where the edge would be. 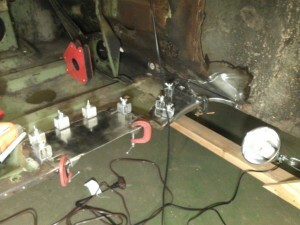 The end result being test fit with the aid of small super magnets is shown in the second photo. I was very happy with the result. 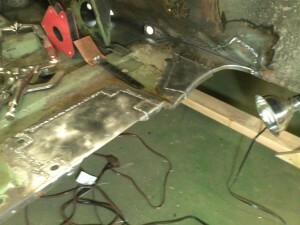 The engine floor also needed a patch where it meets the passenger floor. This patch is 16 ga steel. It has a flange which continues the curve formed on the passenger floor patch. 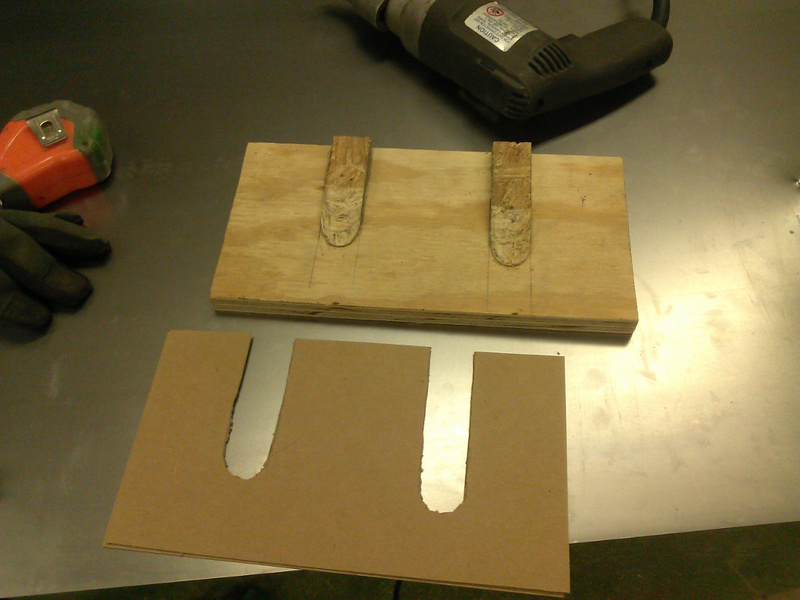 As before, I cut two pieces of plywood with the matching curve, clamped the patch between the two, and gently formed the flange. I found it easier with the 16 ga steel to use the planishing bit in an air hammer. 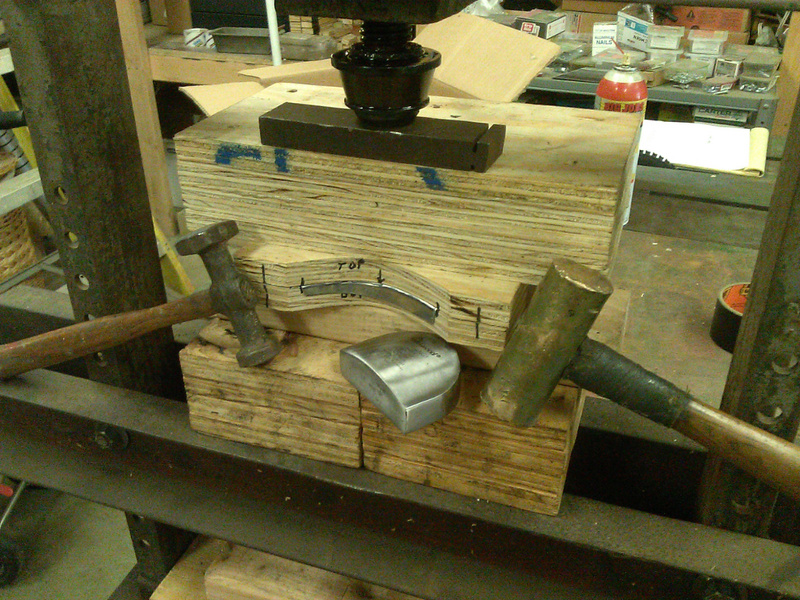 I started the bend with gentle hammer blows, but finished with the air hammer. I think it only took about 50 psi to the air hammer to form the flange. This lower psi made it easy to control the air hammer and provided adequate force to bend the flange gently. 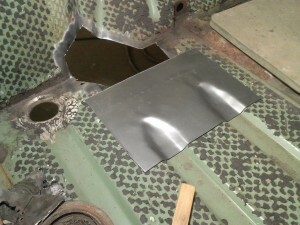 The finished engine floor patch is shown here to the right, and the following photo shows the patch being test fitted with super magnets. The photo to the right shows all patches clamped and/or tack welded into place, ready for final welding. You will notice a second patch to the engine floor in the suspension tower area. 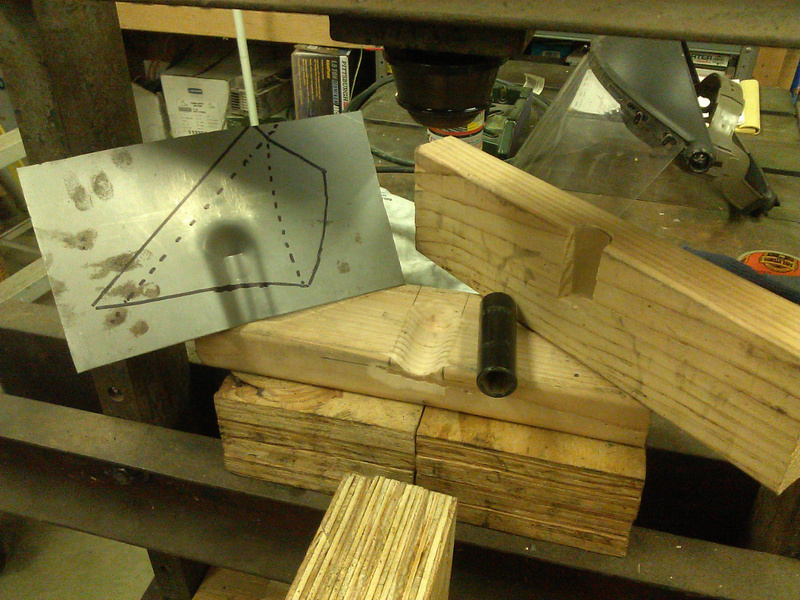 This was rather simple to form with 16 ga steel and needs no further explanation here. The welds were done like other sheet metal patch welds, e.g., a little tack, cool with air, a tack elsewhere, etc. 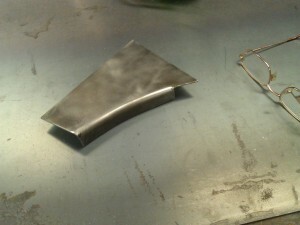 The remaining photos show the finished welds, before grinding. These photos show the finished patches. I primed the firewall and passenger floor patches because I found it very hard to photograph bare metal of varying reflectivity. I might do more cosmetic work later, but I’m really happy with these results so far. 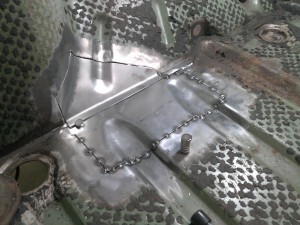 By the way, you might notice the welds at the base of the firewall patch. 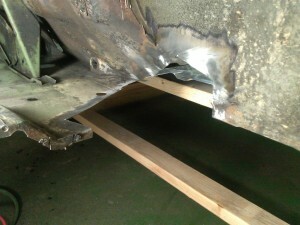 I had thought that the firewall was spot welded to the floor between wheel wells. Not so. 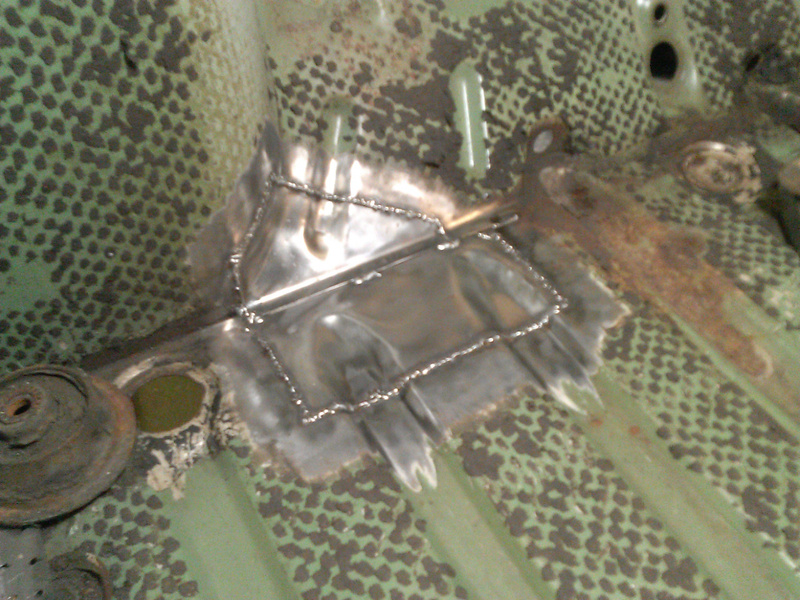 Apparently, the factory wasn’t set up for spot welding here so the firewall was welded just like you see in the photo. 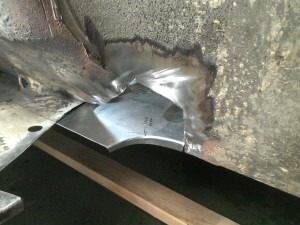 So, these welds are factory correct. Rank amateur? I don’t think so. Your work is very impressive, humbling even. Thanks for sharing your progess and techniques! Yes, the “little things”. To me, those would be big things. This was a very rusty car, I assume, which many would have not wanted to repair. A “tip of the hat” to you for going ahead with this project. Skill and patience, virtues these days. Very inspiring as well! Thanks. 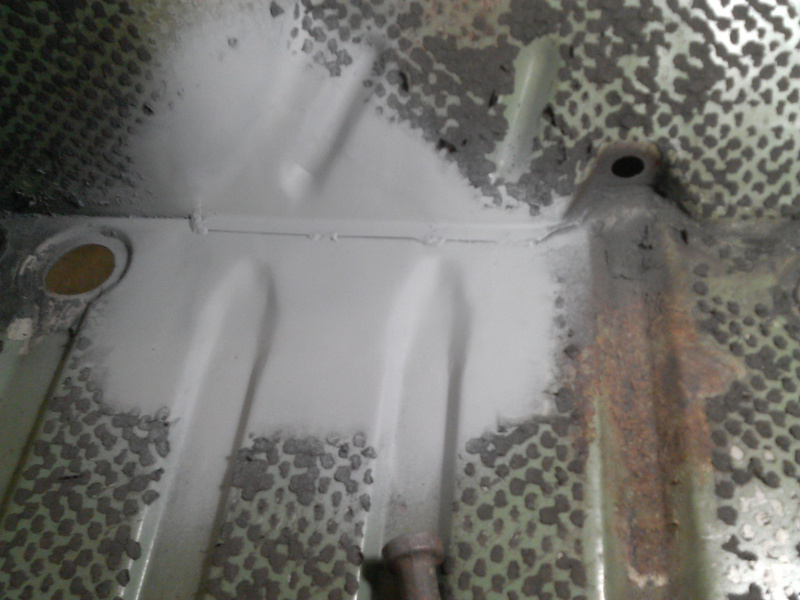 Besides the rust, it was in an accident of some kind. It’s only because it’s a true MC850 that I’m doing this, and because this is about the only way I can afford a solid MC850. Nice work! I bet that’s going to be a very nice Monte Carlo when finished.